When the economy booms and fuel prices drop, truck sales ignite. 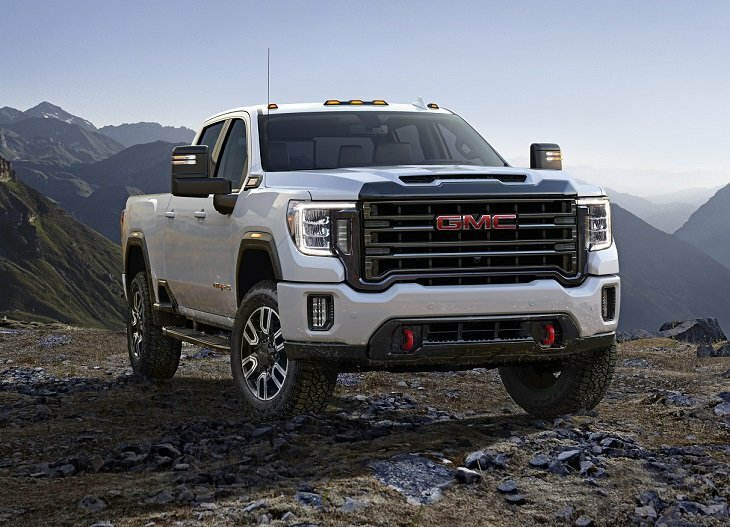 Now, just as recently enacted federal tax cuts are kicking in, GMC comes to market with a new 2020 Sierra Heavy Duty lineup that, in its most potent form, will deliver “well in excess of 30,000 pounds” of towing capacity, according to the truck maker. Given that Ram just debuted an updated Heavy Duty lineup of its own, complete with a claimed 35,100 lbs. of trailering capability, GMC knows what the target is. Longer and taller than the truck it replaces, the 2020 GMC Sierra HD looks bigger and bolder than ever. An elevated hood line contributes to this impression, along with what the company calls a “striking” grille capped by a functional hood scoop that aids the optional Duramax turbo-diesel engine’s improved cooling system. Front and rear, LED lighting is standard. Even the available roof marker lights are LEDs, unless prohibited by law in your state. The cargo bed offers more room than before, with up to 12 tie-downs and an optional 120-volt power outlet. Bed lift-in height is an inch lower for easier loading and fifth-wheel trailering. Standard cargo bed side steps are located forward of the rear wheels to help maximize ease-of-use. GMC has confirmed SLT, AT4, and Denali trim levels. The Sierra HD AT4 trim is aimed at people who go off-roading, and features dark chrome trim, body-color bumpers, a unique grille, and red recovery hooks. All three of those trim levels includes a standard MultiPro tailgate with six different functions to ease loading, unloading, bed access and more. GMC is also offering power extending and retracting trailering mirrors for the new Sierra HD. Inside, the new Sierra HD features more interior room than before, with what GMC claims is class-leading front headroom and legroom. Seating positions re higher, too, for a more commanding view or to ensure a feeling of superiority. Get the Sierra HD AT4, and your new truck comes with a Jet Black leather interior with Kalahari accents and stitching, textured aluminum trim, dark-tinted aluminum accents, and all-weather floor liners. GMC says that half of all Sierra HD customers choose the high-end Denali trim level. For 2020, Sierra HD Denali versions have premium leather, real open-pore wood trim, and dark-finish aluminum décor. An all-new gasoline-fed engine will be standard in the new Sierra HD, but GMC hasn’t divulged details about it as this preview is written. GMC has released preliminary specifications for the available 6.6-liter Duramax turbo-diesel V8 engine. It will crank out 445 horsepower and 910 lb.-ft. of torque, and when properly equipped this is the engine that supplies maximum towing capacity. The Duramax engine is paired with a new 10-speed Allison automatic transmission. GMC has modified the Tow/Haul mode so that it remains engaged on the next key-on cycle, for up to four hours. It will also remind the driver that Tow/Haul mode is engaged in the event that it is no longer necessary. AT4 versions of the truck add and off-road suspension with Rancho shocks, skid plates, a locking rear differential, an Off-Road driving mode, and 18-inch wheels with all-terrain tires. A set of 20-inch wheels wrapped in all-terrain rubber is available. GMC continues to offer its digital variable steering assist technology to optimize the steering according to different driving scenarios, including trailering. Speaking of trailering, GMC introduces several new innovations designed to make towing a trailer easier. In-Command “smart trailer” technology is new, and accessible from the MyGMC smartphone app or through the truck’s Apple CarPlay or Android Auto smartphone integration system. This technology makes it possible to monitor and control certain features of trailers that are compatible with the technology. For example, on a sweltering summer day you could turn on a trailer’s air conditioning system before arriving at your destination so that once it is disconnected from the truck, everyone can get inside and get comfortable. Standard equipment includes a next-generation infotainment system that includes a Trailering App. Using this, owners can check trailer lights, check trailer tire pressure, and set up a trailer profile for the integrated trailer brake controller system. Many of the app’s functions are also offered through the MyGMC mobile app. As an option, the new Sierra HD offers a 15-inch head-up display that includes vehicle speed, navigation instructions, trailering information, and inclinometer, and more. A new Park Grade Hold Assist system enhances the truck’s hill-holding capability, and buyers can also opt for a Rear Camera Mirror and an HD Surround Vision camera system.